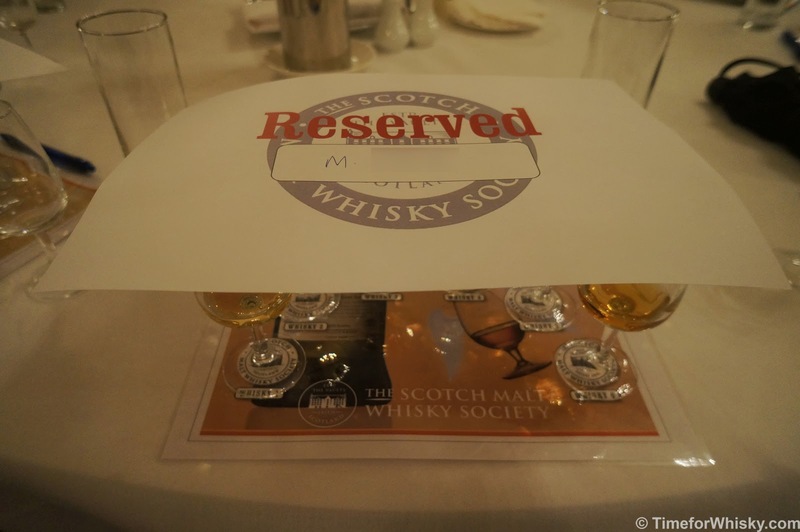 Back in May I blogged about the Australian Malt Whisky Tasting Championship. 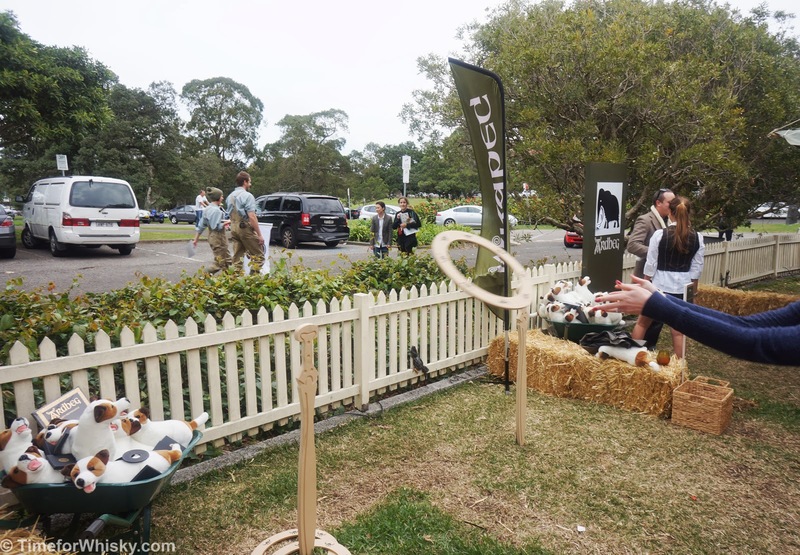 Unfortunately despite best intentions, I was interstate at the time and couldn't participate (pity - that wooden spoon would've been mine!) but from all reports it was a fantastic night, with some fierce competition and a lot of celebrating. 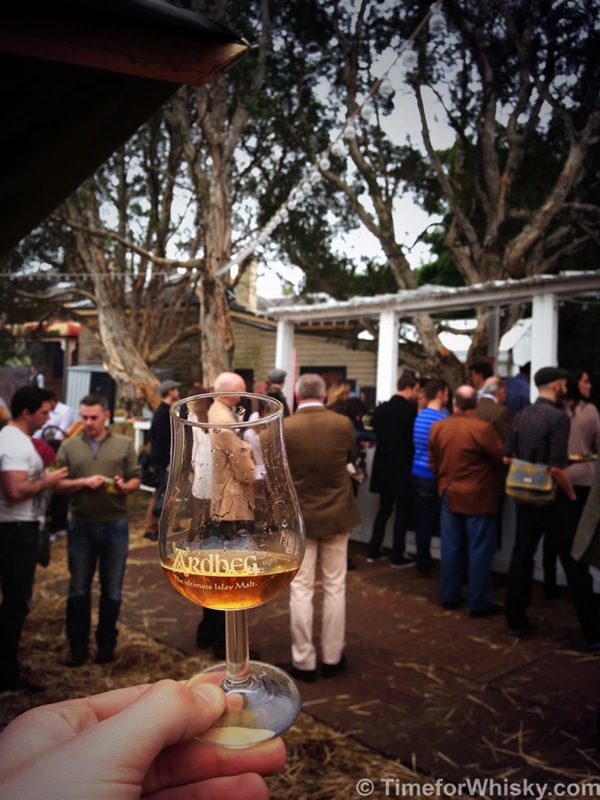 On Friday 21st June, whisky enthusiasts from all over Australia flew in to compete in the annual Australian Malt Whisky Tasting Championship. A major event on the Australian whisky calendar ever since 1989, this year 60 competitors and a large number of spectators gathered in the Dinosaur Gallery at The Australian Museum in Sydney to put their tastebuds to the test and find out who would be the newly-crowned Australian Malt Whisky Tasting Champion. 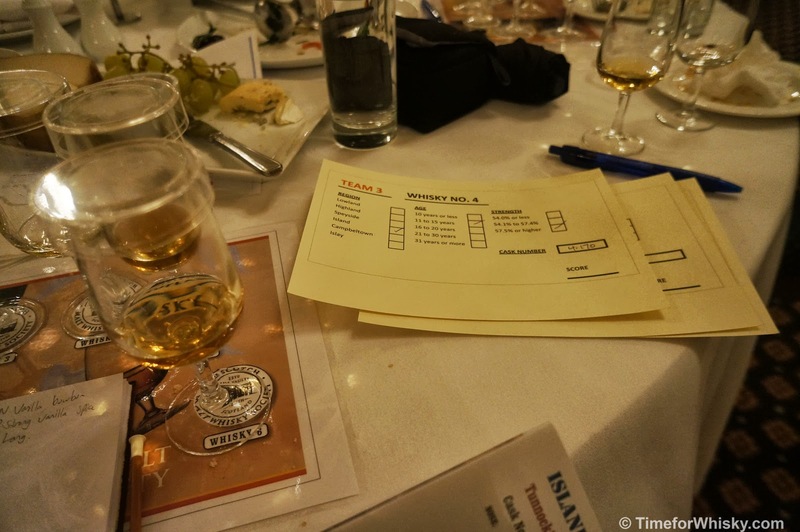 With everyone seated, competitors had 30 minutes to assess the eight whiskies poured before them in a blind-tasting format. Each competitor was provided with a list of nine possible whiskies – the eight on the table, plus one red herring. The task was to correctly identify which whisky was which. 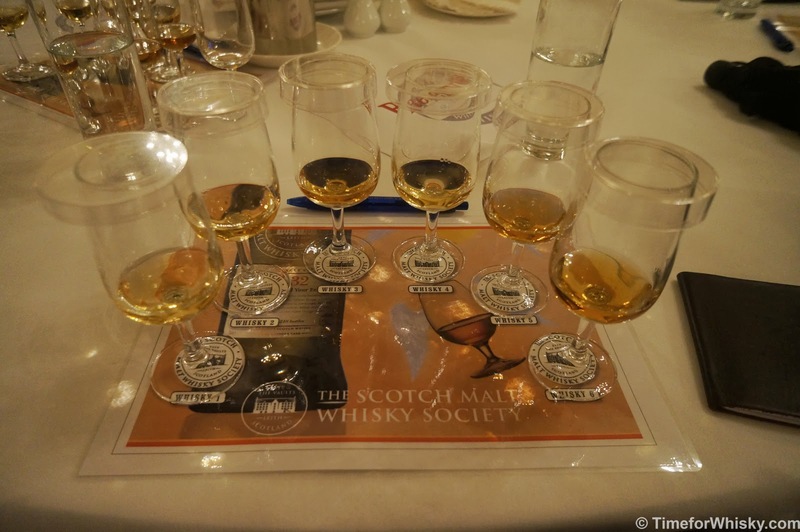 This year’s line up of whiskies featured a large number of Islay/peated malts that were similar in style, and it took some pretty experienced and knowledgeable palates to discern them apart. With the competition part of the night out of the way, the party began – whisky cocktails made with Monkey Shoulder, cask-strength drams from The Scotch Malt Whisky Society, and The Balvenie & cheese matches were amongst the offerings to be enjoyed. And halfway through the party, it was time to announce the winner! Craig Daniels from Adelaide, and previous winner in 2008, took out the title with a near perfect score. 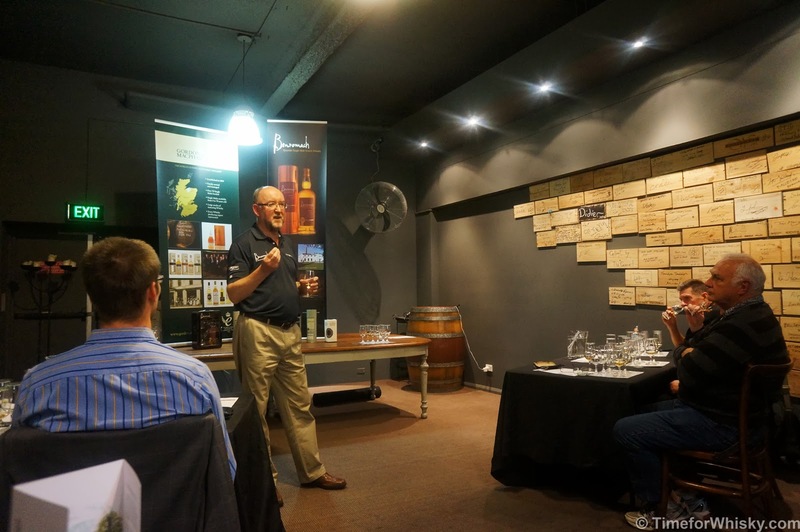 Craig’s reward, apart from significant bragging rights, is a trip for two to Tasmania including airfares and accommodation, with a two-day personally guided whisky tour of Tassie’s distilleries in the Hobart area. 1st prize is valued at over $2,500. 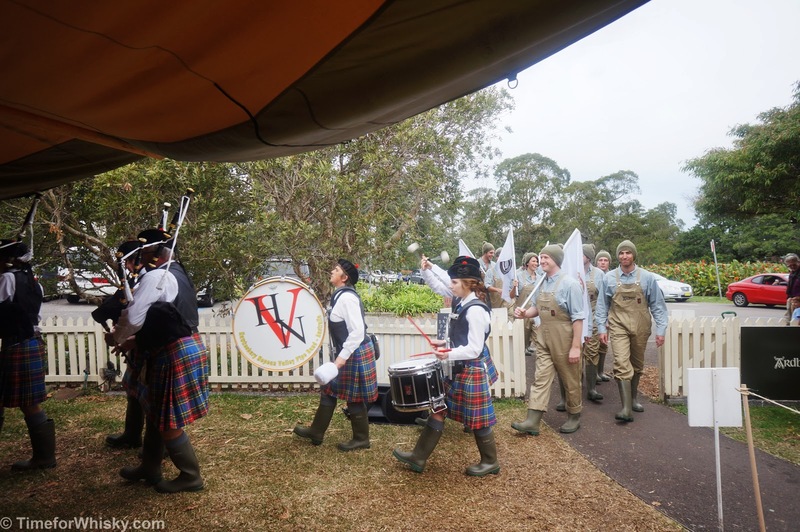 Second place went to James Tait from Sydney, along with a very impressive $1,000 worth of cask strength, single cask, single malt whiskies from The Scotch Malt Whisky Society. 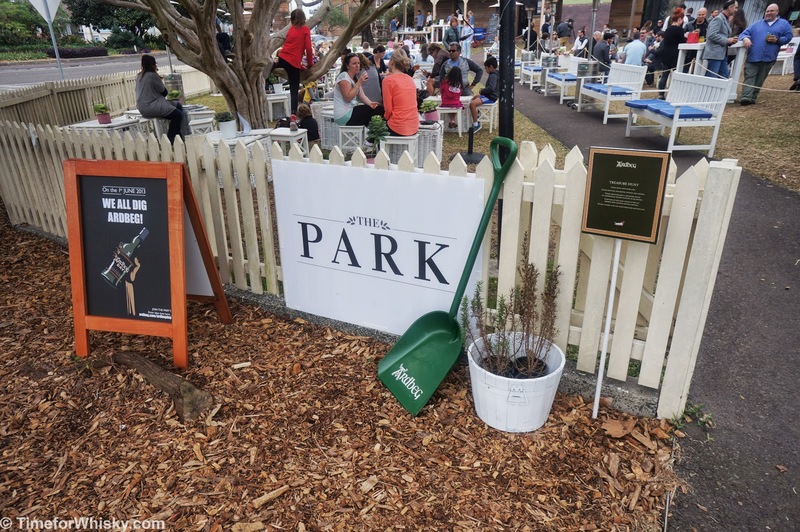 Third place went to Ian Titman from Sydney, who won himself $500 to spend at The Oak Barrel (a bottle shop in Sydney renowned for its whisky range) plus two tickets to their upcoming Whisky Fair later in the year. Since following Nonjatta (which I see as the quintessential resource for Japanese whisky) and learning about Karuizawa, I've been wanting to try it. Like Islay's Port Ellen (but in Japan), Karuizawa is a mothballed distillery selling old stock, often 25+ years old and sometimes for hundreds if not thousands per bottle. Unlike Port Ellen though, there are some younger releases available for a reasonable price. 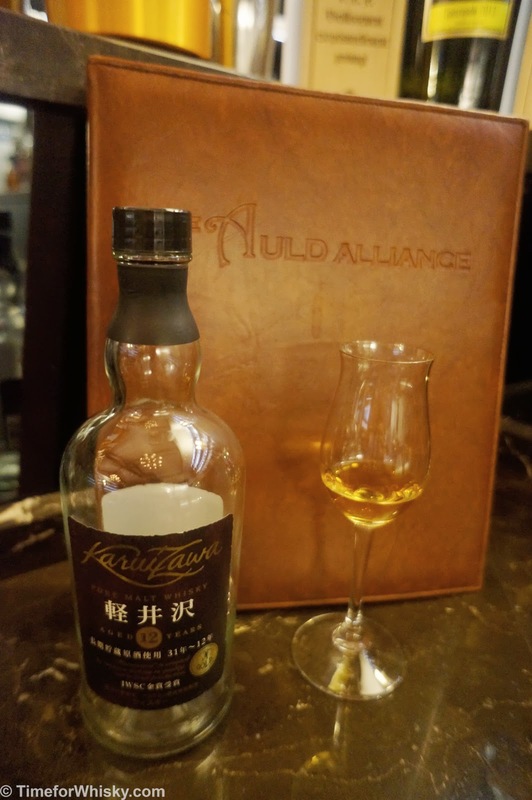 I was keen to try an Original Bottling / standard distillery release (there are many examples of rare Karuizawas released for shops/bars/specific occasions etc..) so when I saw a 12yo OB on the menu at The Auld Alliance in Singapore (see link for my review), I ordered it straight away. So, what did I think of this "Port Ellen of the East"? Nose: Sweet, but not a huge sherry hit. Lots of figs. Palate: Fresh, smooth, but with a youthful tang that gives this away as a (relatively) young whisky. If I had to give it a style, I'd call it a lighter, "aperitif" whisky. Finish: Medium length with fresh fruits (and those figs) coming back in waves. Rating (on my very non-scientific scale): 89/100. A nice whisky, but I wouldn't rush out for a bottle. 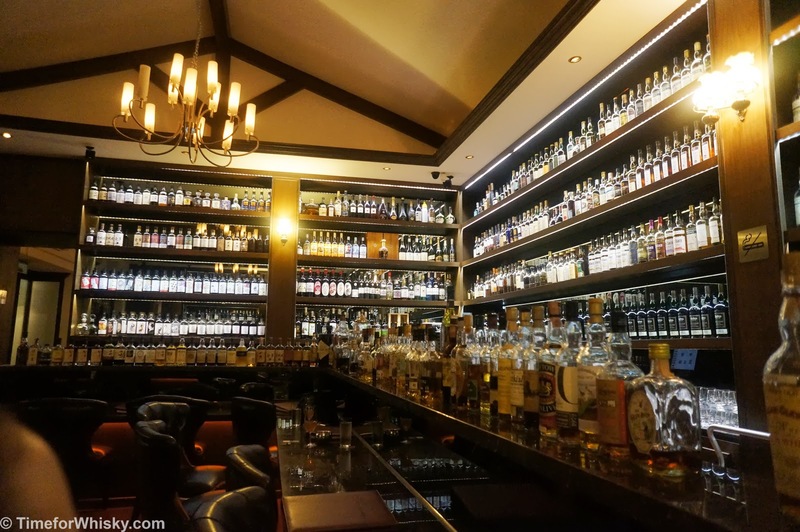 I'd visited The Auld Alliance on a previous trip, and found it to be probably the most comprehensive whisky bar I'd ever seen. I mean, where else can you find an entire page of Ardbeg (30+ bottlings!)? 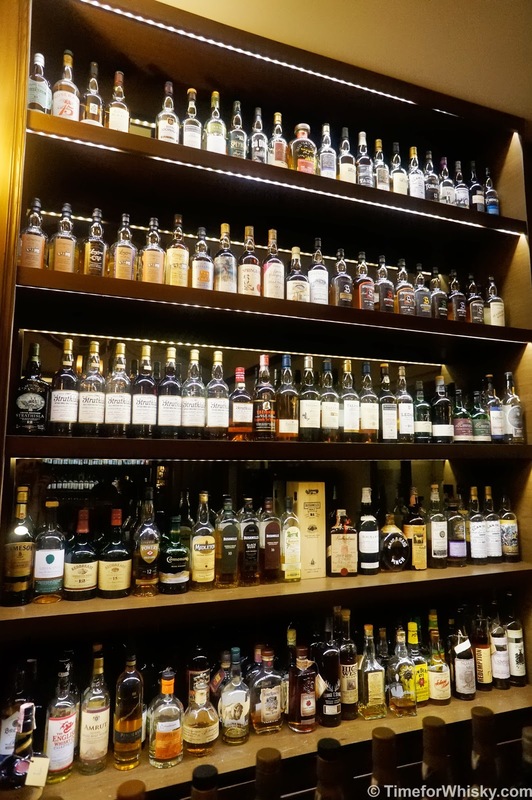 Unfortunately many bottles are only available to be purchased by the bottle (and many run several thousand dollars each), but they do have an excellent selection by the glass. The bar has an interesting layout - with low seating in a U-shape in the main room (below an elevated bar), as well as individual rooms to the left and right. Lighting, noise and service were all perfect. 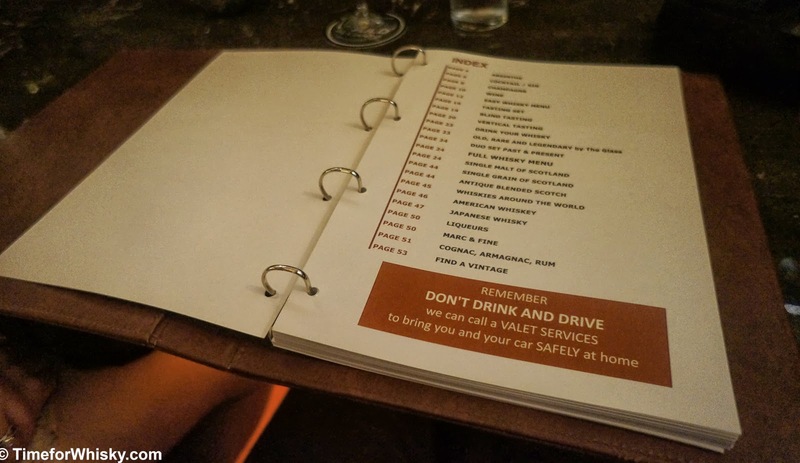 The menu (a weighty leather-bound tome) could keep even the most proficient whisky fan busy, flicking through in awe of the selection (Ardbeg 1974? Check. Glenfarclas Family Casks 1958? Of course. Karuizawa? Sure, which would you like?) It's not just single malt they specialise in either - they have a very decent selection of American whiskey too (I tried a Pappy Van Winkle 15 on a previous visit...sadly no 23 available by the dram). Prices are about what you'd expect for Singapore bars (i.e. not cheap), and I did find myself inevitably making comparisons (possibly unfair comparisons) to Sydney's Baxter Inn, Melbourne's Whisky+Alement and Edinburgh's Scotch Whisky Experience - some of the only bars I've visited with collections that come close to The Auld Alliance. Long story short - the prices are about what you'd expect for such a bar in Singapore. As a rough guide, the whiskies we tried included Karuizawa 12yo OB, Springbank 18yo and Ben Nevis 10yo and I think the bill averaged around $19-20AUD per 40mL nip (one thing I loved was that some whiskies were available by 20mL nips - great for when you want to try a few). On our way out, I mentioned my blog to Matthew (the Manager, nice bloke) who to my surprise mentioned that there was ANOTHER Australian whisky blogger there that very minute. 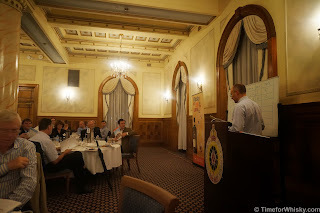 Considering there's probably about 6 or so active Aussie whisky bloggers, it was a pretty amazing coincidence! Turns out it was Squidgy Ash, a very active Perth-based blogger who's blog I'd read before. 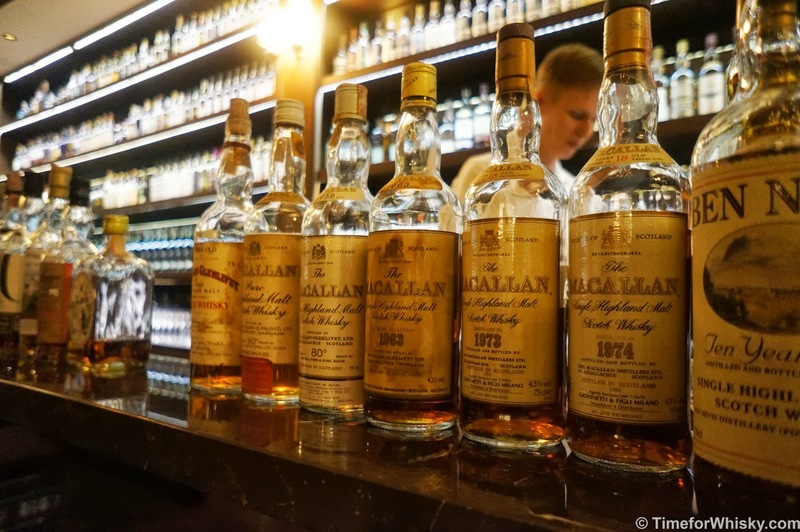 He and his wife were on their way back from a Scotland trip, and reading his latest post, it seems they had their fair share of amazing whisky (makes me want to go back). Small world. 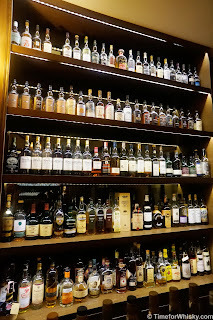 Overall I can HIGHLY recommend The Auld Alliance as a must-visit for any whisky fan visiting Singapore. You can find it in the "Chijmes" complex at 30 Victoria St, and it's open until 1 or 2am depending on the day. It's no secret that I'm a huge fan of The Balvenie. With their traditional methods, floor malting, stunning lineup and innovation, it would have to be one of my favourite distilleries. In fact the Single Barrel 15yo is one of my favourite whiskies, and of the 50 or so bottles I have at home, definitely in my top 3. While I don't own a bottle, the 12yo DoubleWood (or "standard" expression) is a fantastic drop for the money, and my go-to single malt to give away as a special gift. So when I heard William Grant & Sons released a 17yo version, I put it straight on the #101drams list. 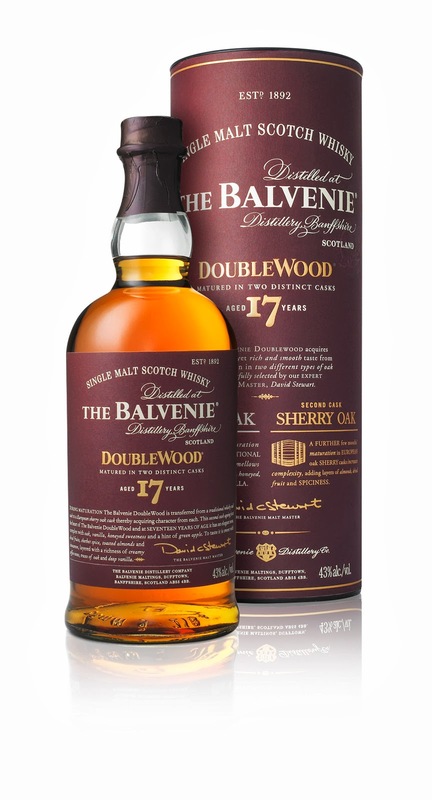 "To craft DoubleWood 17 Year Old, David Stewart, who celebrated his 50th year at The Balvenie in 2012, returned to one of his most celebrated achievements – consecutive maturation in two different types of cask, a process often referred to as ‘cask finishing’. 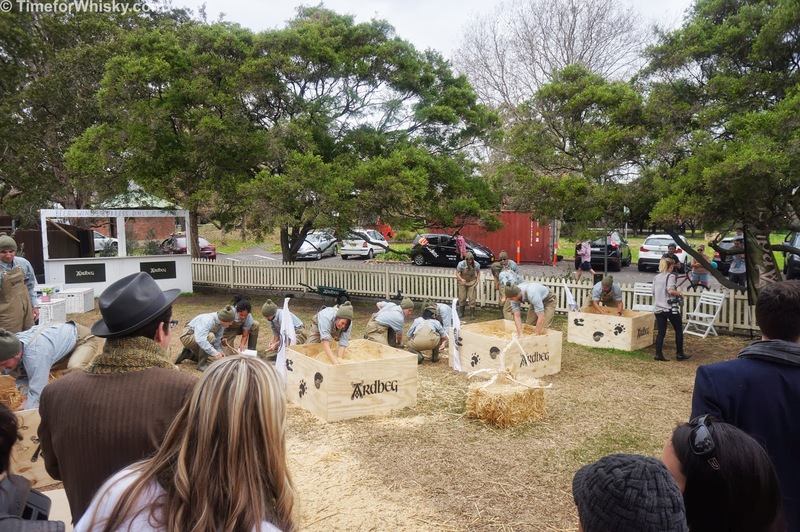 To celebrate the Australian launch of The Balvenie DoubleWood 17 Year Old, one of Australia’s finest Stone Sculptors, Fred Alwahan was commissioned to handcraft 3 unique sandstone bottle plinths for the on trade. Inspired by the returning of the historic Stone of Scone from England to Scotland exactly 17 years prior to the launch date, each handcrafted sandstone plinth will house both The Balvenie DoubleWood12 Year Old and the DoubleWood 17 Year Old, and will be given to key whisky venues, which have supported the brand. The stone craftsmanship displayed by Fred Alwahan emulates the handcrafted nature of The Balvenie as well as the craft displayed by The Balvenie Malt Master, David Stewart. 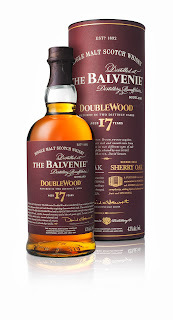 The Balvenie DoubleWood 17 Year Old has an RRP of $170 and is available in Australia from July 3rd, 2013 in specialty whisky retailers." Between this, the recently released TUN 1401 Batch 8, the new Triple Cask Global Travel Retail range, and the regular lineup of excellent drams, The Balvenie certainly show no signs of slowing down. Tasting notes hopefully to follow shortly. A month or two on from my last whisky tasting visit to the Oak Barrel, the gents were kind enough to invite me down for their next masterclass. I was actually given a choice, and as much as I really wanted to attend the Glenfarclas masterclass (partly, but not solely because it included a #101drams whisky - Glenfarclas 40yo), sadly I couldn't make it. I was able to make the Benromach the next night, and so that's just what I did. To be honest, I didn't know a whole lot about Benromach. I'd seen it on the shelves but that's about it. I had no idea, for example, that it was actually owned by Gordon & Macphail (independent bottling extraordinaires - their only single malt) nor that they did some pretty out-there experiments. The tasting was led by Derek Hanckock, Gordon & Macphail's Associate Director of Export, and also a "Keeper of the Quaich"(a society of those with "outstanding commitment to Scotch whisky"). 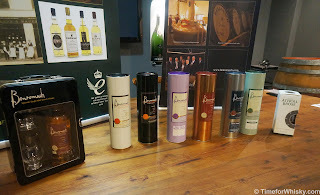 Derek jumped into the history of whisky (dating back to the 1400s, but told unlike any other tasting I've attended), right through to the history of Benromach (the opening of which HRH Prince Charles apparently drove to, but not home from...). Early on it was pretty clear this wasn't a beginner's tasting - which seemed to suit the crowd just fine. See below for my rough/brief tasting notes. Approximately 6yo, designed in the style of whiskies from the 50's-70's. 80% bourbon barrel aged. I got a very light hint of peat smoke on the nose, and some pears. The peat was more evident on the palate, with vanilla and cinnamon hitting at the back of the throat. A short, peaty, easy finish rounded it out. Overall - a nice aperitif whisky. 89/100. Interest whisky this one. Derek talked us through the process to Benromach underwent to produce a certified organic whisky (and he should know - he basically led the process), and explained how all was going along OK until the certifying body asked how they age the whisky - apparently used bourbon barrels are a no-no (due to their likely in-organic origins). The solution? Virgin whisky barrels! Yep, Benromach Oragnic is aged in brand new casks (for approximately 8 years), which explained it's significantly darker colour than the 10yo. While I thought this one had a very cool story (and I'd never tasted a Scotch whisky aged in brand new barrels before), I wasn't hugely keen on it. I got a slightly grainy, vanilla nose, with an oily mouthfeel (and breakfast cereal), followed by a short finish. Certainly not bad, but not my favourite Benromach 87/100. Great background story to this one. Sassicaia is an Italian "Super Tuscan" red wine, and apparently Italy loves Benromach whisky. So when the distillery approached their friends in Italy, they were only too happy to provide their used casks, which were used to finish 4yo Benromach for an additional 29 months. This one had a sweet, rich and berried nose, a peppery, creamy palate and a medium, peppery finish with the berry notes staying right through to the end. 90/100. A sherried but subdued nose - very rich. 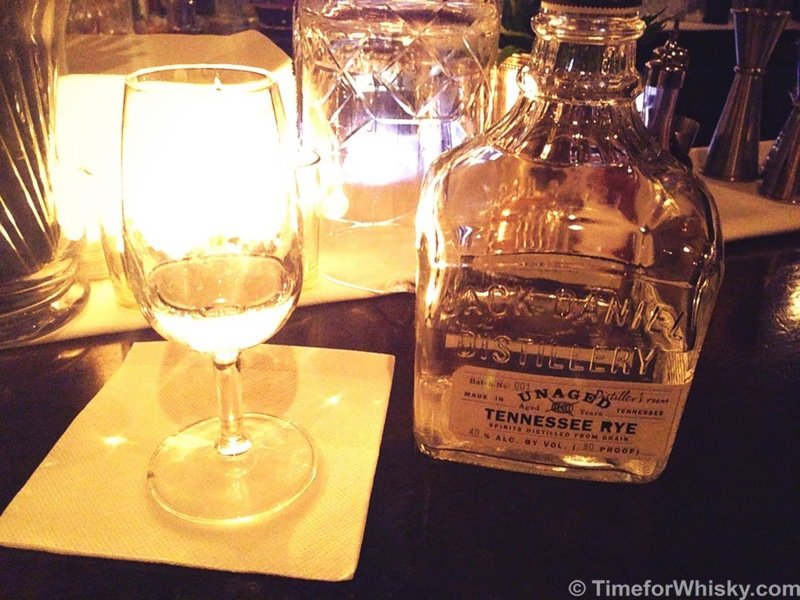 An oily mouthfeel with residual sherry notes on the palate, and a long, grain-like finish that dries the mouth. Pleasant. 90/100. My favourite of the night. At 53ppm (higher than Ardbeg), we were expecting this to be hugely peated. On first nosing though - wait...is this the right whisky? Where's the peat? Derek explained the differences between Islay peat and in-land peat, like Speyside's, and it all made sense. Speyside distilleries aren't surrounded by the ocean like Islay distilleries, so after thousands of years, the peat takes on different characteristics. Fascinating! The palate showed a bit more peat - though nothing like the 53ppm suggests at first. Interestingly, a lot of sweetness too. Sweet & peat! It's like each is fighting to be at the forefront, coming in waves. The same goes for the finish too. Stunning whisky. 93/100. 10ppm and big ABV. A light, sweet, nose with a big green apple hit. Adding water brought out..bananas? Fruit-filled one this one! 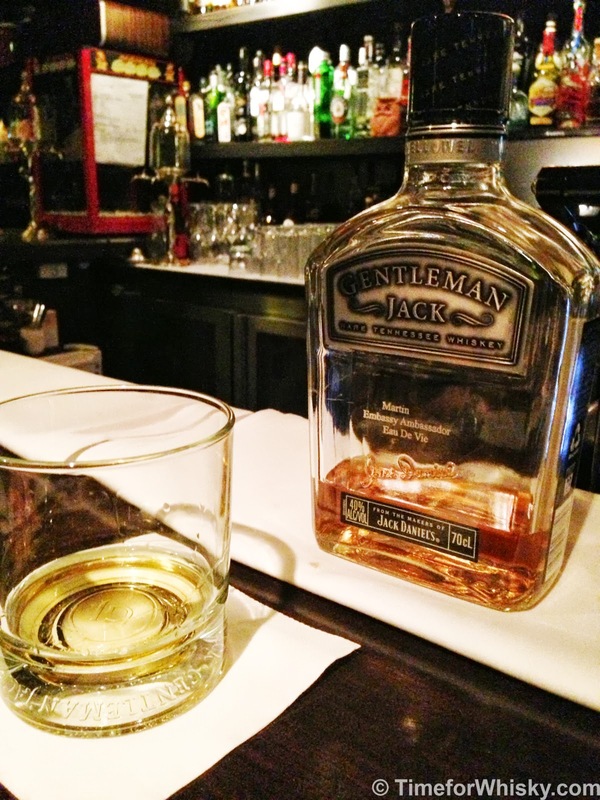 A creamy palate was followed up by a medium finish with mild peppery notes and a hint of peat smoke. Also very enjoyable. 93/100. Last but not least, the liqueur. I haven't met a whisky liqueur I haven't enjoyed (Gleniddich, Chivas Lochan Ora etc..) and this was no exception. Christmas cake and ivy, with some pepper and honey on the nose. Cloves and some cinnamon on the palate, and a short, honied finish. 90/100. 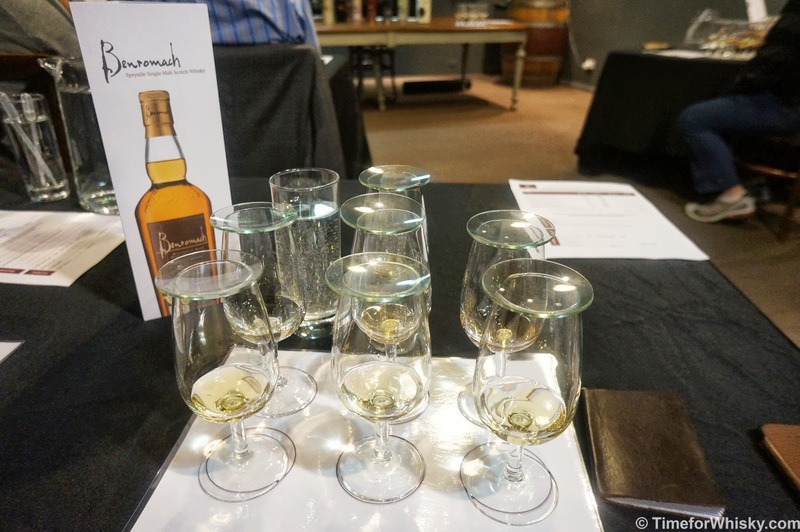 My introduction to Benromach was certainly a well-informed and detailed one, and I loved every minute of it. It was nice to attend a tasting for a change where the majority of attendees were real "whisky nerds" too, and the presenter accommodated. Can't wait for the next one. 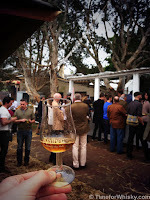 Check The Oak Barrel's events page for details of upcoming tastings (for both members and non-members), including their Sydney Whisky Fair 2013. TImeforWhisky.com attended this tasting as a guest of Oak Barrel (thanks)! I added this to the #101drams in the hope that I'd be able to try it at a Duty Free shop on my next trip overseas. Sure enough on a recent long weekend trip to Singapore (during which I sampled many excellent whiskies and visited two fantastic whisky bars - posts to follow!) I spotted it for sampling at SYD Duty Free. Nose: No peat that I could discern (so I doubt there's a lot of Islay whiskies in here as with some JWs). Rich and sweet, with a hint of caramel. Palate: Rich and oily. A sweet, almost ice-cream like creaminess follows. Finish: Smooth, very smooth. I was expecting a harsh finish but wasn't disappointed. I'd say there are some well-aged whiskies in here (I'd love to know the composition). Some sweetness and a whole lot of mouth-puckering dryness. Rating (on my very non-scientific scale): 88/100. A decent blend. A quickfire tasting post to tick off one more off the list - this time from Campbelltown, in the form of Sprinkbank 10yo. Nose: Light and fruity, with some intense orange notes. Palate: Tangy - citrus tang. Some youth, but very smooth. I'll have to try the older varieties to see how this progresses with age. Finish: Medium length. Light, and fruity right to the end. 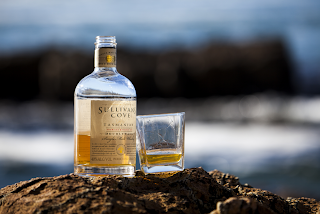 A beautiful summer whisky. Rating (on my very non-scientific scale): 91/100. I actually really enjoyed this, and think it'd make a fantastic easy-drinking "summer" whisky. Would I buy a bottle? At the $100+ it can command in Australia? No. But at the $50-$60 it goes for overseas, I think this would be a great addition. I might consider picking up a bottle on a future trip. 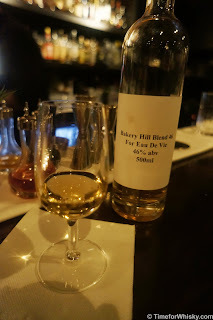 Last week I wrote about Eau de Vie's partnership with Bakery Hill Distillery to create a bespoke whisky for use in their "Bobby Burns" cocktail. Soon after that post we popped down to Eau de Vie in Darlinghurst (Sydney) for a taste (and maybe a cocktail or three...) following an invite from owner and Sydney bar legend Sven Almenning. Nose: Sweet, smooth, creamy. Almost like ice cream, but not that diet stuff - the full cream / full fun ice cream! Palate: Sweet shortbread. Seems to have some youth, but very, very smooth. Morish - made me want to keep going back for more. A slight earthiness too. Very enjoyable. Finish: Very short (presumably this works well for the cocktail, to allow the other flavours to have a say). The sweet (port barrel?) notes stay through to the end. Rating (on my very non-scientific scale): 89/100. A great dram with some very specific characteristics (e.g. short finish) that should work brilliantly in the cocktail. 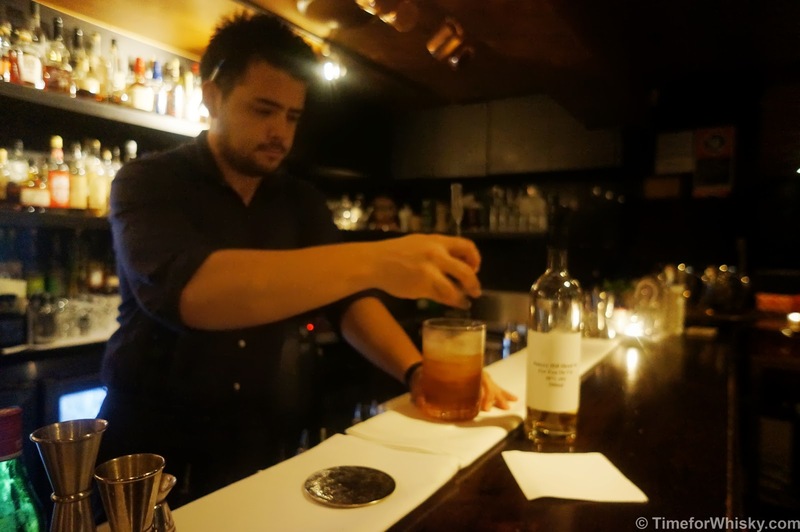 Yep, it was pretty clear these guys put some serious effort into selecting / blending the perfect whisky for the cocktail. 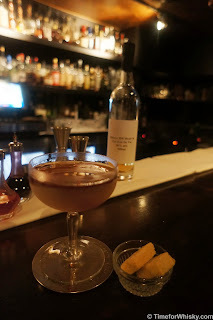 Eau de Vie cocktails have always been perfectly harmonious, but this was just something else. Every ingredient just worked in perfect harmony, with no single spirit overpowering the others. A slightly bitter taste (brown, bitter and stirred - just the way a good cocktail should be!) was followed by a long, sweet (but never to sweet) delicious aftertaste. Perfect. Even the shortbread was a perfect match. Definitely add this to your list of "Cocktails to try". A few cocktails, a JD unaged rye and a dram of our Gentleman Jack bottle later, it was time to head home (why can't Wednesdays be Fridays?) happy to have tried a fantastic whisky, ticked another off the #101drams list, and tasted near cocktail perfection. Another year, another brilliant Ardbeg Day. 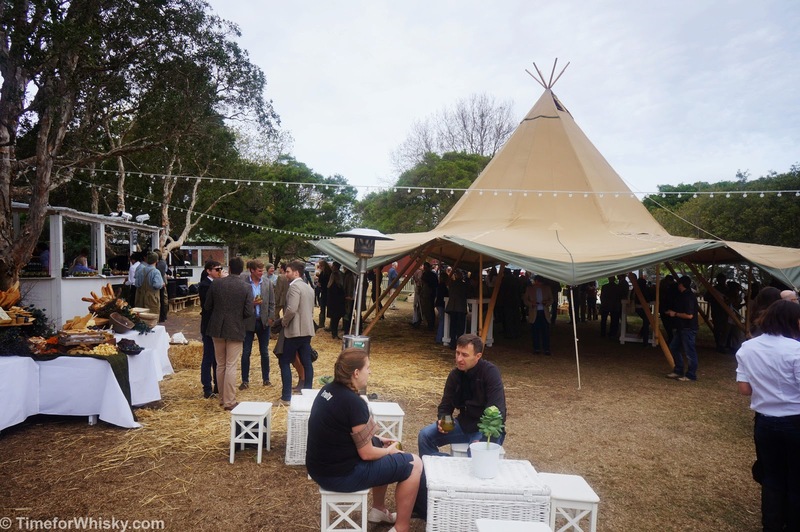 I thought it would've been pretty hard to top last year's "Islay-lympics" at Aqua Dining, but the team from Moët Hennessy have put on another fantastic event. 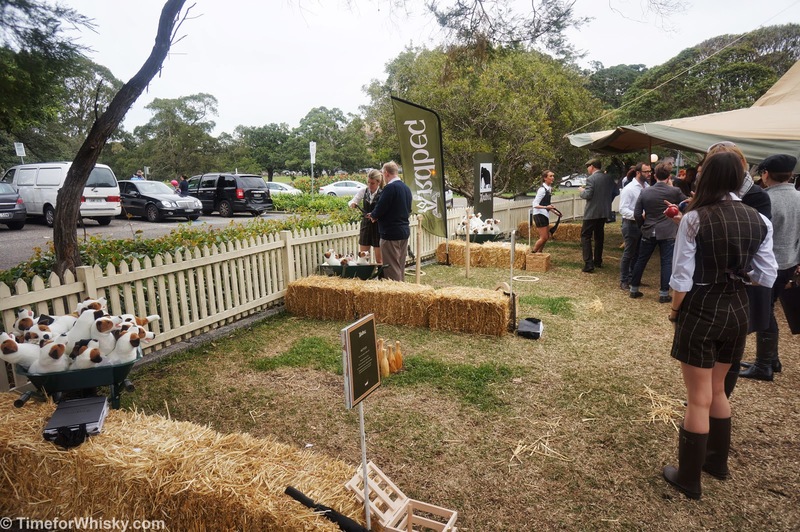 Australian Whisky event of the year? Well there's a few good ones coming up, but it's certainly possible. For those unfamiliar, Ardbeg Day is a celebration of all things Ardbeg, held annually around 1st June for Committee Members around the world. 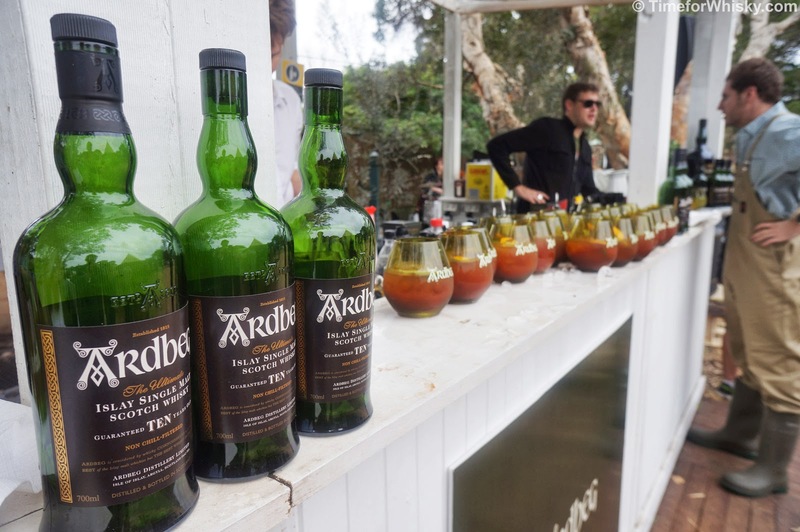 The main festivities occur on Islay as part of Fèis Ìle, but that doesn't stop Ardbeg and MH in 10+ other countries putting on their own Ardbeg Days, with activities, prizes and of course a lot of Ardbeg. 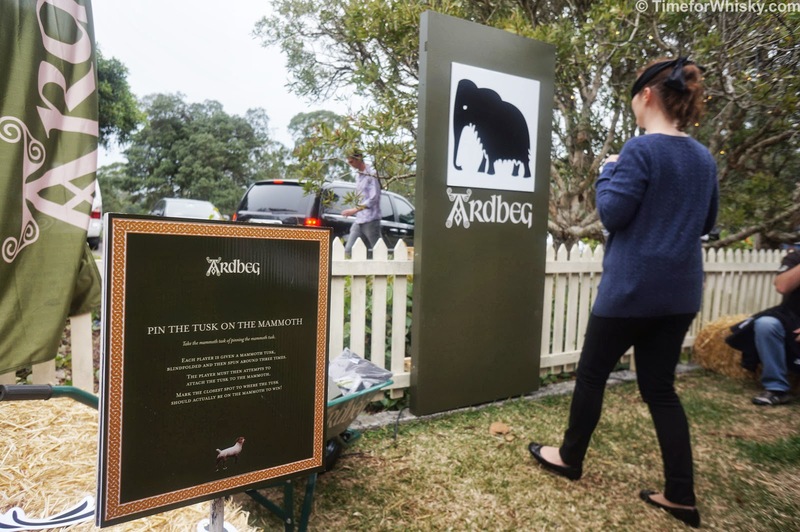 The annual event also coincides with the release of a new, limited Ardbeg release. 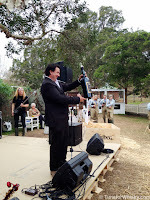 Last year's was the super-imaginatively titled "Ardbeg Day", and this years, as you might have guessed, was "Ardbog". 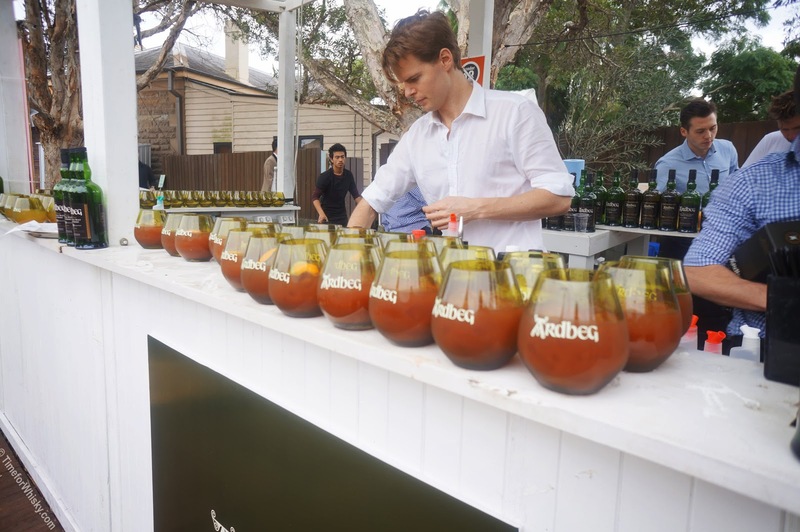 Held at Pelicano's popup bar "The Park" in Sydney's Centennial Parklands, the event kicked off around midday with an Ardbeg cocktail on arrival (Bloody Mary, Passionfruit or a strangely tasty concoction with Absinthe, soda and Ardbeg). Those not fond of cocktails were welcome to avail themselves of the complimentary tastings of Ardbeg 10, Corryvreckan or Uigeadail (the Ardbog came later). Small hidden coins were also scattered around the grounds, with a bottle of Ardbeg for anyone who could find one (sadly we couldn't). That wasn't the only game though - with "Pin the tusk on the mammoth", "Quoits" and bowling all very popular right throughout the day. Prizes included stuffed "Shortie" dogs, Ardbeg keyrings/cardholders/big glasses/coasters/t-shirts, and for some lucky winners (like our friends from DTWC), a copy of "Ardbeg: A Peaty Provenance". There were plenty of prizes to go around and it seems everyone won at least one or two. The bar continued to serve cocktails and Ardbeg right throughout the event, and the (subtantial) food offerings were enjoyed by all, while the band (The Bearded Gypsy Band - a very appropriate choice!) 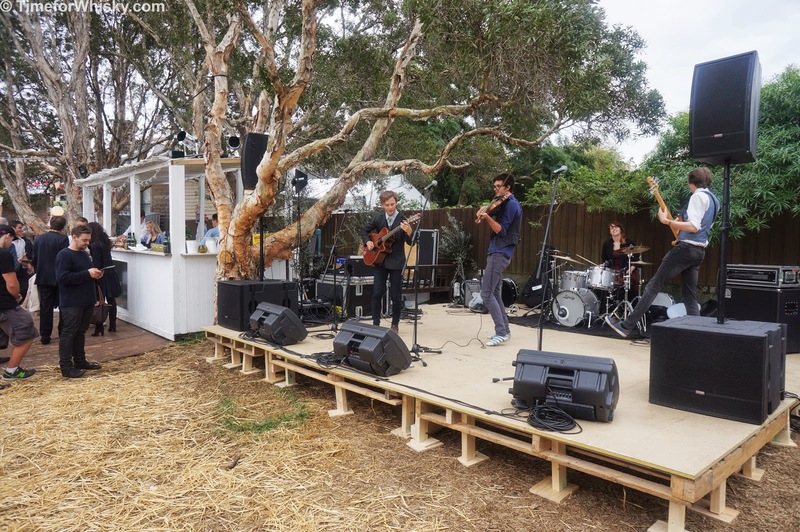 played their blend of gypsy jazz folk (note: that's not them in the video below). All up a fantastic day, and while not as wet as last year, true to Islay form the rain did make an appearance right at the end (unfortunately we missed out on an Ardbeg umbrella!). 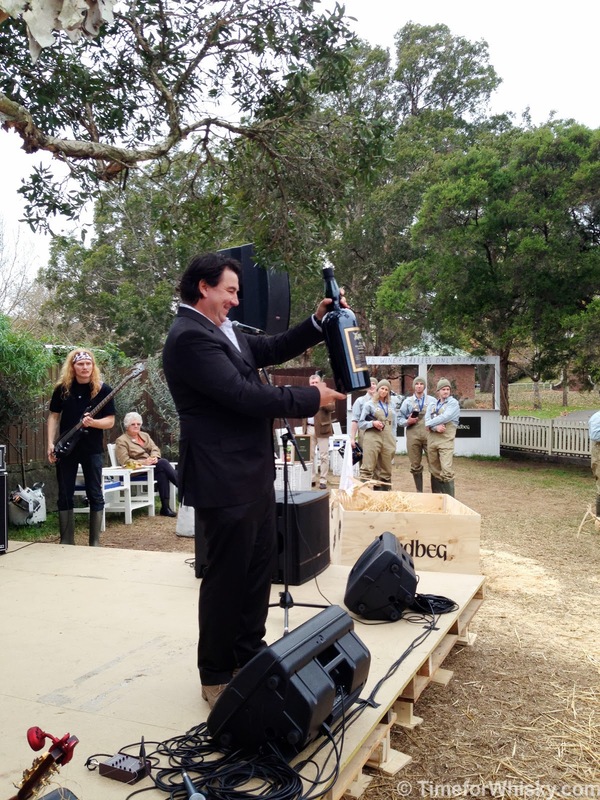 A huge thanks to Ardbeg and Moët Hennessy for another hugely entertaining day. Bring on 2014!